Charley Benetton is a broken man, his life destroyed by alcohol and regret. He loses his job. He leaves his family. He hits rock bottom after discovering he won't be invited to his only daughter's wedding. And he decides to take his own life. Charley takes a midnight ride to his small hometown: his final journey. But as he staggers into his old house, he makes an astonishing discovery. His mother - who died eight years earlier - is there, and welcomes Charley home as if nothing ever happened. 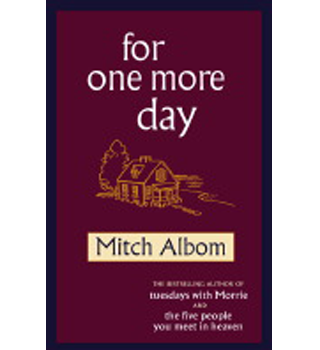 What follows is the one seemingly ordinary day so many of us yearn for: a chance to make good with a lost parent, to explain the family secrets, and to seek forgiveness. I had read this book before, many years ago, before I knew how it felt to lose someone. I hadn't taken much from it; I enjoyed it, yes, but it didn't hit me quite as hard as it did this time. You would have to spend a lot of time, with a lot of well-prepared arguments, to convince me we don't all take our parents for granted. Of course we do. The love they pour upon us in different ways, whether it's asking if you're home safely, or sticking some money into your bank account, is all testament to the unique selflessness that can only come from loving a child. Albom shows us a heart-rending and impactful example of the guilt and circumstances involved in not giving this love back to the best of your ability. Chick Benetto tells the story of his life's descent which led him to attempt suicide. At the end, he is allowed one more day with his mother, who passed away eight years previously. A countless number of us would do anything for this chance with a loved one, and the storytelling through flashbacks was nothing other than gorgeous. Chick remembers the times he wasn't there for his mother, and remembers the times she was devotedly there for him. He learns of things she did for him, things she had given up for him, and of all the ways she loved him he hadn't previously had any inkling of. The plot is nice, and flows well, with some interesting family commentary, and a couple of plot twists. Despite this, the message is the key thing here. Although part of this is to encourage us to make the most of the treasure of life, the most important thing is to make the most of the treasure of family. Simple, but steeped with true Albom emotion, this is a hard hitter. Don't postpone your visits, appreciate the company, and phone your mum before the freedom to do so is taken away.